Through the Looking Glass - Ch. 12: Which Dreamed it? Ch. 12: Which Dreamed it? 'Snowdrop, my pet!' she went on, looking over her shoulder at the White Kitten, which was still patiently undergoing its toilet, 'when WILL Dinah have finished with your White Majesty, I wonder? That must be the reason you were so untidy in my dream-- Dinah! do you know that you're scrubbing a White Queen? Really, it's most disrespectful of you! 'And what did DINAH turn to, I wonder?' 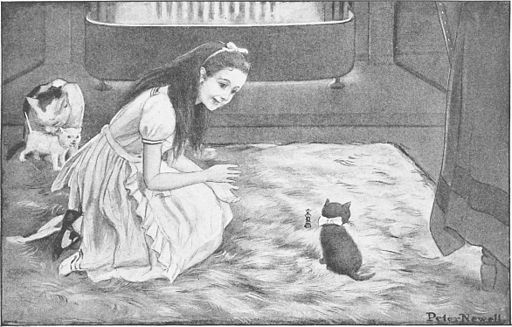 she prattled on, as she settled comfortably down, with one elbow in the rug, and her chin in her hand, to watch the kittens. 'Tell me, Dinah, did you turn to Humpty Dumpty? I THINK you did--however, you'd better not mention it to your friends just yet, for I'm not sure. 'By the way, Kitty, if only you'd been really with me in my dream, there was one thing you WOULD have enjoyed--I had such a quantity of poetry said to me, all about fishes! To-morrow morning you shall have a real treat. All the time you're eating your breakfast, I'll repeat "The Walrus and the Carpenter" to you; and then you can make believe it's oysters, dear! 'Now, Kitty, let's consider who it was that dreamed it all. This is a serious question, my dear, and you should NOT go on licking your paw like that--as if Dinah hadn't washed you this morning! You see, Kitty, it MUST have been either me or the Red King. He was part of my dream, of course--but then I was part of his dream, too! WAS it the Red King, Kitty? You were his wife, my dear, so you ought to know--Oh, Kitty, DO help to settle it! I'm sure your paw can wait!' But the provoking kitten only began on the other paw, and pretended it hadn't heard the question.